It Pays to Stay Connected! Play the Hottest New Slots! Take a spin on an old favorite or one of the newest and hottest slots at Gold Dust West Casino – Reno! 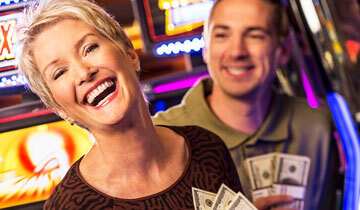 With over 450 slot machines, there are a variety of choices from 1¢ to $1 games, video poker and keno. Try the video reels and slot reels for even more excitement! Be sure to use your Gold Rewards Club card when you play to cash in on the benefits of Reno’s most rewarding Players Club. It pays to play at Gold Dust West. Our Gold Rewards Club is the key to earning valuable points, special offers, and access to exciting promotions and tournaments. Membership is free...sign up today! If you’re age 50+ and have earned 50 points, enter one or both of the weekly tournaments. Noon – 1:30pm and again from 2:00pm – 3:30pm Plus, you can receive a free meal when you earn 50 points!